Platteville junior guard Josie Nies had 14 points, five assists and four steals in a 73–59 non-conference win over Dubuque Hempstead last Monday night. POSTED November 29, 2018 12:40 p.m.
PLATTEVILLE — It doesn’t look like much has changed for the talented Platteville girls’ basketball team under first-year head coach Mike Foley. The preseason Southwest Wisconsin Conference favorite Hillmen defeated visiting Dubuque Hempstead 73–59 in Foley’s Platteville debut in last Monday’s non-conference season opener to avenge a 61–56 loss to the Mustangs in the 2017–18 opener. Junior center Sami Martin, who is drawing Division 1 interest and already has Division 2 scholarship offers from Winona State, Minnesota–Moorhead and University of Mary, dominated in the paint finishing with a game-high 25 points on 7 of 11 shooting and a perfect 11 of 11 from the free throw line. She also grabbed a team-high 13 rebounds and passed out three assists. Martin missed last year’s game at Hemptead with an injured ankle. Junior guard Becca Hoyer was her usually pesky self on defense and a secondary scoring threat in transition, finishing with 18 points, six steals and three rebounds. Junior point guard Josie Nies ran the offense, knocked down three 3-pointers, passed out a team-high five assists and finished with 14 points and four steals. Fellow junior Izzy Carroll added a near double–double of nine points, nine rebounds and four steals. 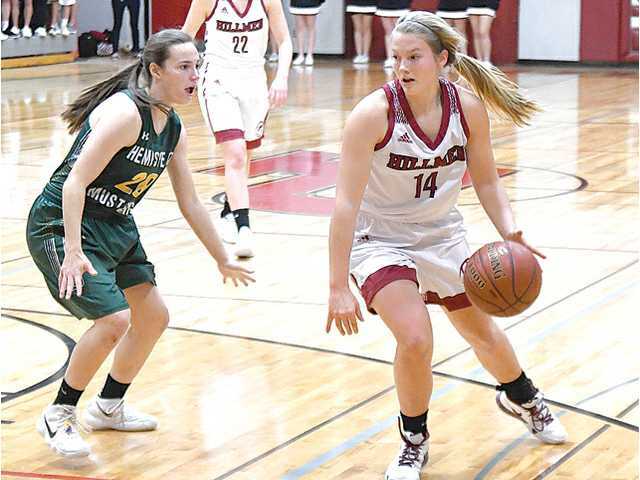 Three-time All-SWC selection Skye Digman and two-year starter Rachel Bailie are gone from last year’s 20–5 team that won a third straight WIAA Division 3 regional titles under former coach Brandon Temperly, but the 2017–18 Hillmen look very similar under coach Foley, who went 151–159 in 14 seasons as the girls’ head coach at Fall River from 1998–2012. Foley’s Hillmen pressured Hempstead on the perimeter, looked for fast break scoring opportunities when available and made a concentrated effort to feed Martin on the block in the half court offense. The result was a 14-point victory over a Division 1 team from Iowa that returns nine players from last year’s 16–7 team. The Hillmen held a slim 19–16 lead through the first 10 minutes of play, but junior guard Courtney Budden scored in the lane to ignite a 15–5 Platteville run that pushed the lead to 36–23 with 3:12 left in the half. Martin had nine points in the run, including a 3-point play and back-to-back baskets on nice interior feeds from Nies. Hempstead battled back with a 10–3 run of its own to close the half down just nine at 39–33 after Sydney Paulsen’s 3-pointer with 44 seconds left in the opening half. Foley’s Hillmen regrouped in the locker room and opened the second half on a 9–0 spurt to extend the lead to 15 and never looked back. Hoyer scored on a drive on Platteville’s first possession after intermission, Nies buried a triple moments later, then Martin and Hoyer combined to make four straight free throws to make it 48–33 just two minutes into the second half. After back-to-back baskets by the Mustangs, Nies buried another 3-pointer and Martin scored inside a minuter later to make it 55–37 with 12:47 left. The Hillmen hosted Darlington (2–0) Tuesday night and will next travel to Lancaster Friday night for the Southwest Wisconsin Conference opener for both teams. Dubuque Hempstead (0–1) — Sydney Paulsen 13, Ella Johnson 7, Kaylie Springer 3, Olivia Dryer 3, Madison Fleckenstein 9, Morgan Hawkins 4, Riley Bleymeyer 16, Corinne Meier 2, Riley Kay 2. Totals – 21-61 9-16 59. Platteville (1–0) — Sara Langmeier 1, Becca Hoyer 18, Courtney Budden 6, Josie Nies 14, Sami Martin 25, Izzy Carroll 9. Totals – 23-51 23-32 73. 3-point goals — DH: 8 (Paulsen 4, Johnson 1, Springer 1, Dryer 1, Fleckenstein 1); P: 4 (Nies 3, Carroll 1). Total fouls — DH: 25, P: 17. Fouled out — none.